Akati, a mother to two young chimps, suddenly died at the Detroit Zoo on Tuesday morning. She was only 28 years old, which is middle-aged for a chimp. Roy Lewis took this beautiful photo of Akati. "We are shocked and saddened by the sudden loss of 28-year-old chimpanzee Akati, who collapsed and died this morning at the Great Apes of Harambee," the Detroit Zoo wrote on its Facebook page. "She was a lovely, intelligent being and a wonderful mother." Kelly Anne Berg took this adorable photo of Akati and Akira. Akati's children, Ajua, 7, and Akira, 4, are still dependent on a mother's love and care and will sorely miss her. 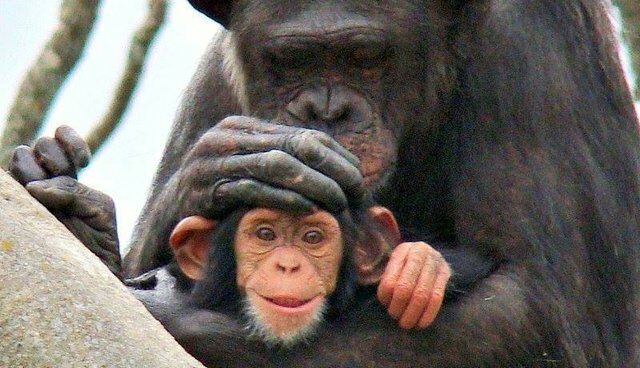 According to the Jane Goodall Institute, the bond chimpanzees have with each other, especially between mother and child, is very strong; mothers and dependent young (up to age seven or so) are always together. Patti Truesdell took this sweet photo of Akati and Ajua. Chimps, one of our closest relatives in the animal kingdom, have to tailor their instincts for life in captivity as opposed to the wild, where they travel up to 10 km per day, according to the organization Friends of Washoe. In zoos chimps tend to show more behaviors that stem from restlessness, like overly groomed skin, continual rocking, spitting and feces throwing. But Friends of Washoe say that The Detroit Zoo is one of the better zoos for chimps, using only chimpanzees who had once been used for pets and entertainment, and not taking free chimps from the wild. Lee Ann Woods Fisher took this beautiful photo of Akati, Ajua and Akira. This leaves Akati's sudden death this week enshrouded in mystery. "As with all animals that die at the Detroit Zoo, a necropsy (animal autopsy) is being performed to determine the cause of Akati's unexpected death," the zoo wrote. "Our staff, volunteers and visitors will miss her so very much." Learn more about chimps here.